The Colonels came into tonight’s last non conference game with Brescia on a two game losing streak. Last Saturday they traveled to Pittsburgh and loss in overtime to Duquesne 85-84. Fast forward a week and the Colonels were looking to get back in the win column before Ohio Valley Conference play begins. 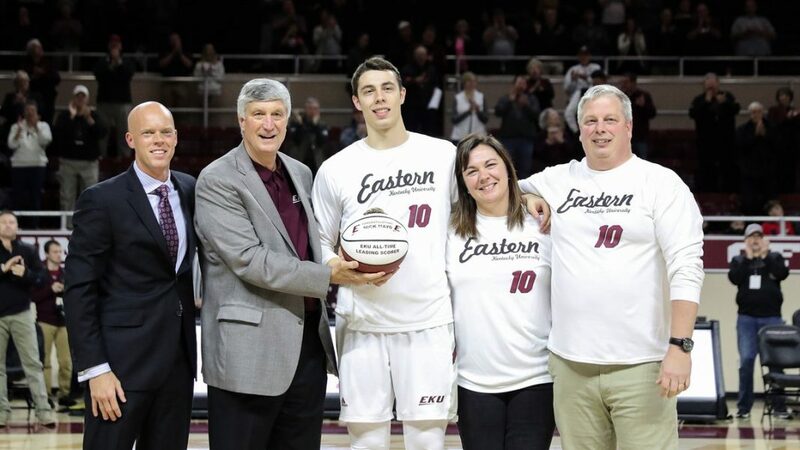 Before the game Nick Mayo was honored for becoming the all-time leading scorer in Eastern Kentucky history. Nick’s family flew in for the ceremony from Maine. The Colonels have played Brescia twice winning both games, last match up was in 2013. Brescia was not intimidated early as they ran out to a 8-2 lead. At the 14:28 mark of the opening half Colonels took the lead and never looked back. Colonels led 58-44 at halftime. Colonel defense forced 19 turnovers in the half and held Brescia to 43% shooting. Mayo with 10 points to lead the way at the break. Second half the Colonels put on a clinic setting a new team record for scoring, 143 points, and they placed 7 players in double figures scoring. The previous team high in points was set in 1987 against Wilbureforce at 123 points. Defense for EKU held the visitors to only 8 made field goals in the second half and it forced 39 turnovers in the game. EKU had 30 assists to only 10 turnovers, had 28 steals, and scored 75 points in the paint. Lachlan Anderson led the Colonels with 22 points and 13 rebounds. He had plenty of help tonight with DuJuanta Weaver adding 17 points, Nick Mayo with 16 points 6 rebounds and 5 assists, Jomaru Brown with 12 points, freshman Tre King filled the stat sheet with 14 points, 6 rebounds, 5 assists, and 5 steals. Jordan Oakley 2 points, Peyton Broughton 7 points, freshman Houston King 18 points and he knocks down 6 three pointers, Kelvin Robinson 16 points, Carmen Carmichael 7 points and 5 assists, and Pedro Bradshaw just misses a double double with 14 points and 9 rebounds. Colonels improve to 7-6 and open OVC play January 3rd at Austin Peay. You can hear that game live on the Coyote 100.7 as Greg Stotelmyer takes the last train to Clarksville to bring you the game. Previous articleWeekend Weather Forecast with Grendalyn Morton and Unlimited Roofing!